Adopt your own alpaca - It's the perfect gift for every occasion!!! A unique way of having alpacas in your life without having to own one......we offer adoption packages to suit everyone and they make ideal gifts for birthdays, Christmas, mother and fathers day. - Adopt alpaca, sheep or pig. - Receive a personalised adoption certificate. - Photo of your adopted animal. - Information on your chosen animal. - Photo key ring of your adopted animal. - Sample of your alpaca fleece. Why not add a Alpaca soft toy from £5 ? Visit our shop for more details. We offer bespoke adoption packages for schools or Groups call 07753333784 for details. I am an award winning light fawn coloured boy. I have a huge character and a big heart. I love my cuddles and you will be amazed how soft I am as you sink your hands into my fleece. Playful and a real joy to be around, you will fall in love with me I hope. Mace is a real favourite with visitors. Dark Knight is one of the most gentle alpacas you will ever meet. He loves to be walked and have a good old fuss. He keeps all the boys in check, but can also be a bit cheeky himself. Father to some of the other alpacas on the farm so very special here at Lucky Tails. He is a complete cutie. His big brown eyes melt your heart. He is now two years old and growing into a ladies man. everyone who walks him falls in love. He has an amazing fleece which is a soft fawn colour and will be turned into a luxurious yarn to make socks. Norman - Follow him on his face book page!! He is my blue eyed boy. His amazing blue eyes match his blue/grey fleece. A larger than life personality wins over everyone who meets him. Norman can kick like the best kung fu artists but is a gentle chap once on a halter and the smallest of visitors have walked him. A regal alpaca who seems to attract all the baby alpacas who love him. The only alpaca we have ever seen give his paw for food. I am Bubble the rare breed Valais black nose sheep from Switzerland. I live with my twin sister "Flip-Flop" and we love to bounce around the fields. We welcome visitors to the farm and do our best in making sure the alpacas do not get all of the attention. How can you not fall in love with his unusal and beautiful markings. 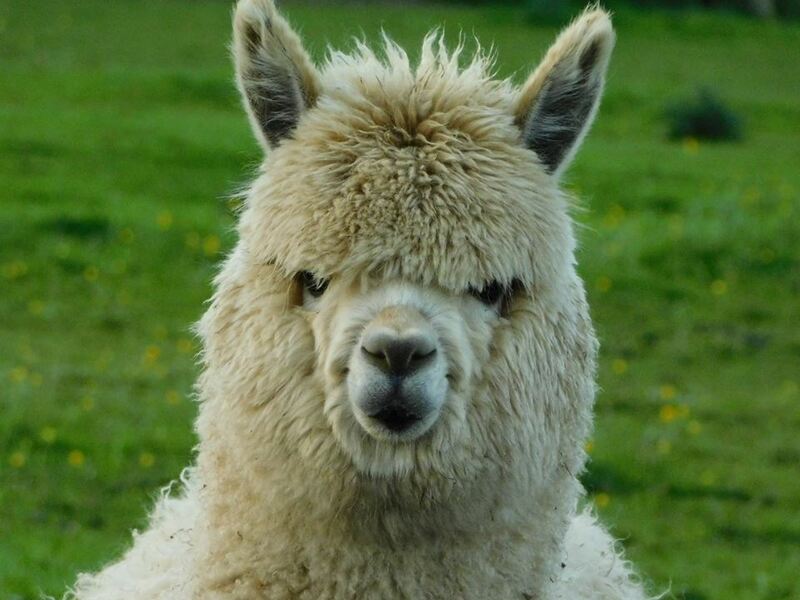 He is a lively chap, a really friendly alpaca.He loves to play with his alpaca freinds and is full of fun. Bert is an absolute star. He is the noisest animal on the farm in the morning until he has had his breakfast. Rub his back and he will roll over like a dog to have his tummy tickled. Once he knows you have food in your pocket he will follow you all the farm.